Mayor Edward B. Murray of Seattle: Tell Sister City, Daejeon, South Korea, That We’re Opposed to the Torture and Consumption of Dogs and Cats. Daejeon “the New Hub City for Korea states on its website that it “has a high standard of living for foreigners”. Daejeon, with the slogan ‘Vibrant Daejeon Happy People’ boasts that the City Government “rolled its sleeves and worked very hard to … revitalize its local economy through promotion of tourism”. But ‘vibrant’, ‘happy’ and ‘high standard of living’ are not words anyone can use to describe the way in which the dog-meat trade inhumanely raises and brutally slaughters its millions of animals each year. 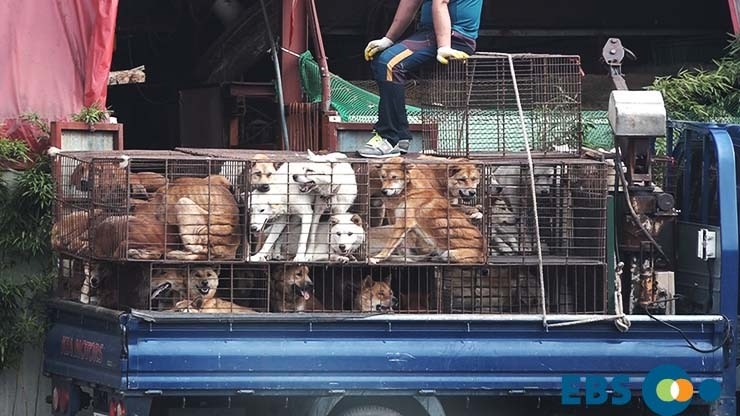 Daejeon is one of the largest dog meat consumption areas in South Korea; it has countless dog slaughterhouses, markets and restaurants where these pitiful dogs are subjected to the final brutality of being electrocuted, hanged, or beaten – then thrown into boiling water – sometimes while still alive. In many places these dogs (some stolen or abandoned pets) are killed in full view of other terrified, caged dogs. And this takes place in public and in broad daylight. So, what foreign resident or tourist could feel really comfortable being in a city whose ‘happy people’ do nothing to stop this aberrant meat trade? 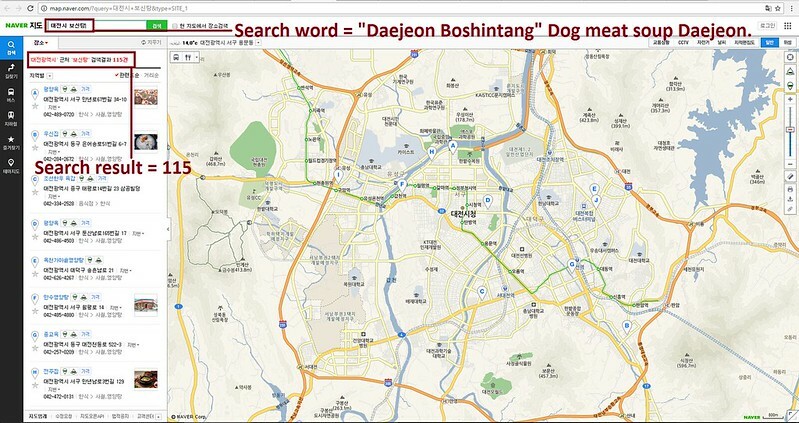 The searches resulted in: 462 Health Food Centers; and 115 restaurants in and around the city of Daejeon alone. Even if half of these ‘Health’ Food Centers and restaurants serve dog and cat ‘ingredients’ in one form or another, just imagine how many dog/cat slaughterhouses must be present in and around Daejeon in order to supply all of these outlets. The Mayor of Daejeon states that he feels “it is an honor and profound responsibility to serve the people of Daejeon”. But the best way for the Mayor to live up to this claim, and to really prove a Vibrant Daejeon with Happy People would be for him to end the dog and cat meat trades in his city. Daejeon became Sister city with Seattle in 1989. Please sign petition, call and email Seattle Mayor Edward B. Murray TODAY! Click HERE to send an online message to the Mayor Murray. Daejeon is one of the largest dog meat consumption areas in South Korea. 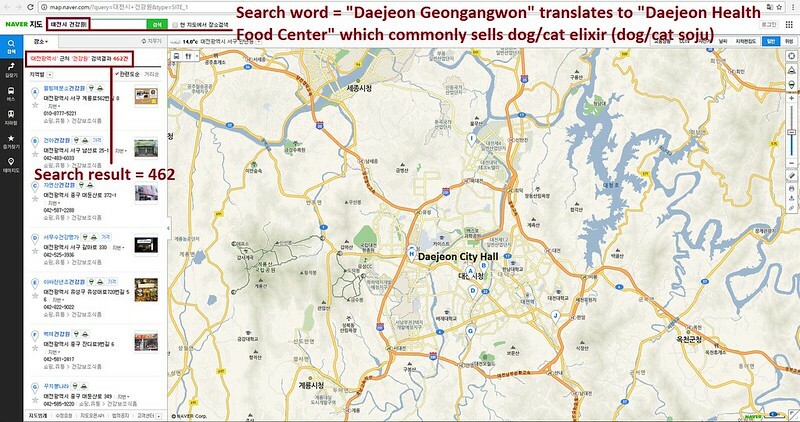 The Korean internet searches resulted in: 462 Health Food Centers which commonly sell dog/cat elixirs (also known as dog soju and cat soju); and 115 dog meat soup restaurants in and around the city of Daejeon alone. No matter where you live PLEASE SHARE these actions with your friends – especially those who live in Seattle! Please stop the inhumane practice of torture killing dogs and eating them. Folks, PLEASE do NOT post your letters here! Send them to the addresses listed above! Your letters and comments do no good if the people you write them to never see them.